After extensive online research and going to the embassies in person, I have discovered that it is extremely difficult (I don’t want to say impossible, because nothing is impossible in Nigeria) for a non-Nigerian resident to obtain a Ghanaian visa in Nigeria. If you have a resident visa it is possible, but those of us without resident visas cannot obtain a Ghana visa from the Ghana High Commission in Nigeria. You have to apply for a visa online and pick it up at the point of entry to Ghana. If you do that, you should absolutely fly to Ghana from Nigeria. I would advise against any non-Nigerian person in Nigeria from traveling to Ghana by road because 1) the transit visas you need for Togo and Benin will cost N 17,000 (about $130) total (N 7,000 for Togo and N 10,000 per two entries in Benin) and 2) for all of the hold-up and wahala (problems) you will face at each border. Even my Nigerian host family said the border patrol gives them a hard time. One of my friends said he, a Nigerian, and his white girlfriend tried to go by road and were forced to turn back because of the constant questioning and hold up they met at each police check point. He said they could spend up to 45 minutes at each one waiting while the Togolese officers scrutinized his girlfriends passport and travel documents. It’s either you stand your ground and wait out the questions or give in and pay an unknown amount, he warned. The latter could get expensive and they still might not let you pass. Speaking fluent French would be to your great advantage. So if you are a white person coming to Nigeria and plan to travel to Ghana while you are here, make sure to obtain the visa in your home country to avoid all of this disappointment that I have experienced. One option for foreign travelers getting around West Africa is finding someone with connections (which is not hard) to help you get an ECOWAS passport. The Economic Community of West African States is a group of 15 West African countries that works to build joint economic development in the region. ECOWAS passport holders can travel to any of the participating countries without a visa. Ghana and Nigeria are ECOWAS countries. From what my local sources have told me, all you need is about N 20,000 ($133), passport photos and pam, you have a golden ticket to West Africa. The passport would be legitimate and approved. As afore mentioned, anything is possible in Naija. As for the questioning you would get as a white person holding a Nigerian passport at the border, I am unsure, but at least you have the documentation. One thing is for sure, this holiday season, I am staying in Nigeria. A tortuous trip to Lagos and back in one day resulted in every transportation company informing us that is impossible for us to enter Ghana. Under our time constraints we could not acquire Ghanaian visas. No one had a concrete answer for us about whether we needed one visa, two visas, zero visas. The whole trip ti jasipabo (has fell apart/been ruined). So we are depressed and back in Ibadan. If you are an American traveling around west Africa, I advise you acquire your visas ahead of time or travel alone or in small groups. From what we’ve been told, it is impossible for us to get Ghana visas in Nigeria because we are not Nigerian. I don’t think it would be hard to travel throughout this area if you were alone however. Much of the problem, I think, lies in the fact that we are five whites traveling together. Some of the companies said that if we were one or two the driver could sort out the necessary payments at each border, but five people is just too many. Hopefully I will get to Ghana someday but I have no idea how or when. For now, we will resort to Plan B: traveling around Yorubaland, which has potential to be equally as fun holiday as Ghana. It’s a plus that we already speak the language anyway. After all, mama agba (my grandmother) said to me this morning, “In every disappointment lies a blessing.” I like to look at life from this perspective. After a grueling three weeks of planning, re-planning and hitting roadblocks at every turn, we are almost en route to Ghana for a vacation. It is not easy to make plans to travel by road to other African countries if you have white skin. We have to be wary of border patrol ripping us off or detaining us for hours. We have to make sure the road transportation companies don’t demand an outrageous price. Information about visas-whether we need them for passing through Benin and Togo or not-has differed from every person we’ve talked to. Traveling by road was our first choice so we could see the coastline and Benin and Togo. It has been exhausting planning this trip. It shouldn’t be this difficult to get five Americans to Ghana. After all the inquiring I did with road transport countries like Cross Country, we resorted to let the transportation director at University of Ibadan figure it out. Nigeria is a great country, you all know I love it, but it will be great to get out and see another west African country, especially one that I have heard is so safe, calm and welcoming to Americans. Hopefully we will be able to use our Yoruba there since I don’t know any Twi. Happy Thanksgiving to everyone at home! I will be posting from Ghana as much as possible. Ire o! After an hour and a half on the highway and a short okada ride we arrived early at an imposing, vine covered wall and gate. 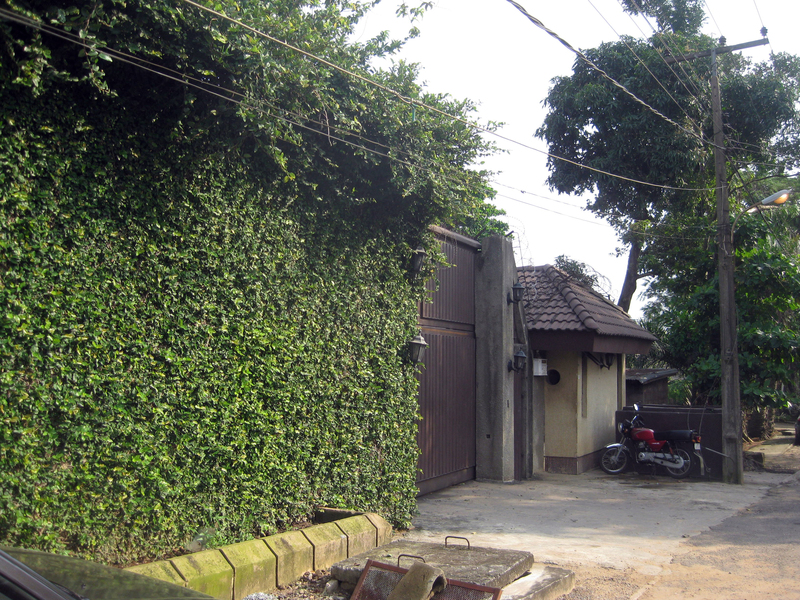 The front gate to Yemisi Shyllon's compound. A man peeped his eyes out a small hole to see who we were, my mom explained the reason for the visit and shortly the guard opened the iron door. 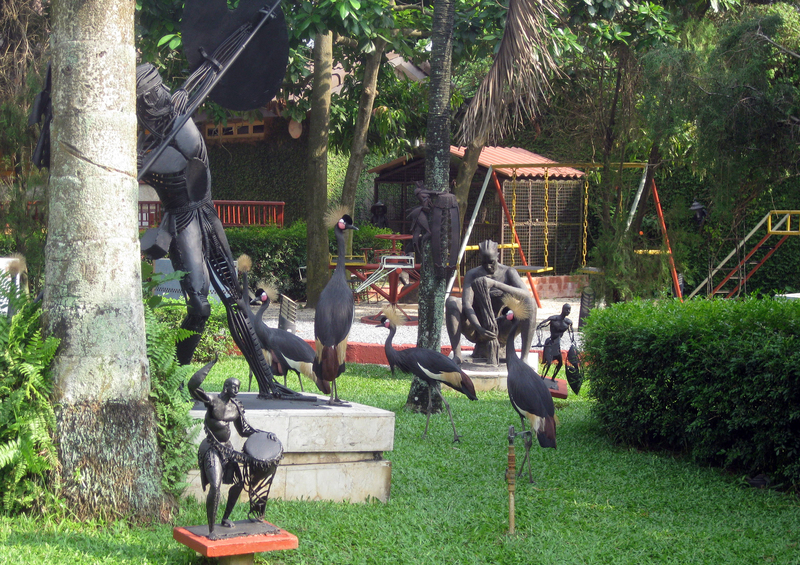 What we beheld on the other side was a mix between a tropical paradise, mini zoo and a sculpture garden. We could not believe our eyes. My mom and I walked through the stone path passing life size sculptures of African women and men in various working poses. We passed male and female peacocks sauntering around the grassy lawn, in and out of the sculptures. 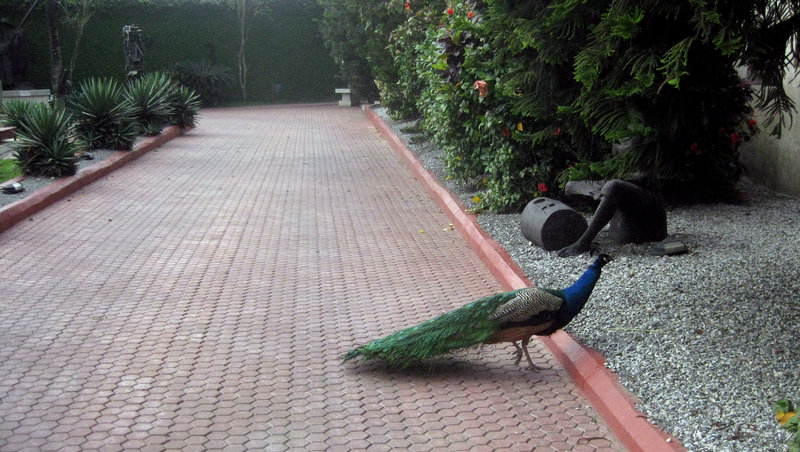 Female peacocks stroll freely around the garden. A pen full of white geese with orange beaks and massive tortoises on the right side, my mouth agape with awe and utter shock. We found our way to the office to see the illustrious man who owns the outrageously stunning front yard. 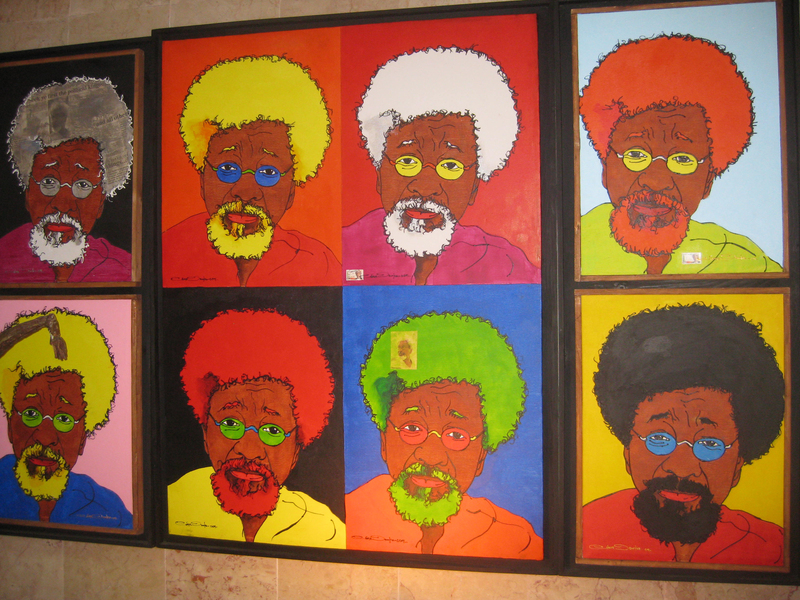 An Andy Warhol style depiction of Wole Soyinka that hangs in Shyllon's office. In his office we encountered a 60 inch flat screen T.V. on the wall surrounded by stunning pieces of African art–An Andy Warhol style portrait of Wole Soyinka, a 3-foot sculpture of a gold fish with jade eyes from the Philippines, carved wood statues to name a few. The man of the hour is Prince Yemesi Adedoyin Shyllon, a retired engineer/lawyer, an avid art collector and most recently the founder of the Omooba Yemisi Adedoyin Shyllon Art Foundation (OYASAF). He is a philanthropic, jet-setting father of three who lives for collecting art. Shyllon and Layiwola pointing out art pieces in the backyard courtyard. My host mom, Peju Layiwola is an artist and professor of art at the University of Lagos. She and Shyllon met to discuss the 6-day art workshop she is organizing at UniLag next year that will be sponsored by Shyllon’s art foundation, OYASAF. The scheduled meeting about the workshop’s budget turned out to be an all day affair, including a tour of the art museum that is his house and lots of friendly conversation. 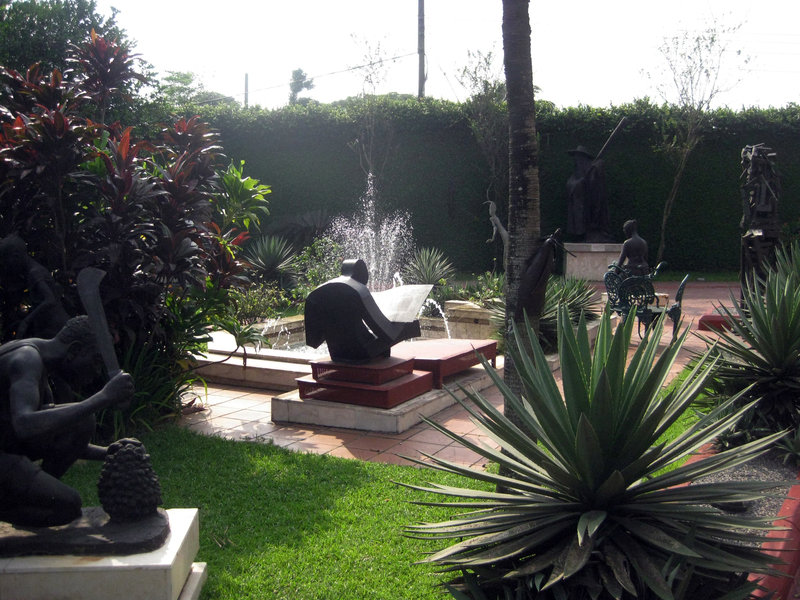 A full size sculpture of a woman pouring water from a calabash is a fountain in his courtyard pool. 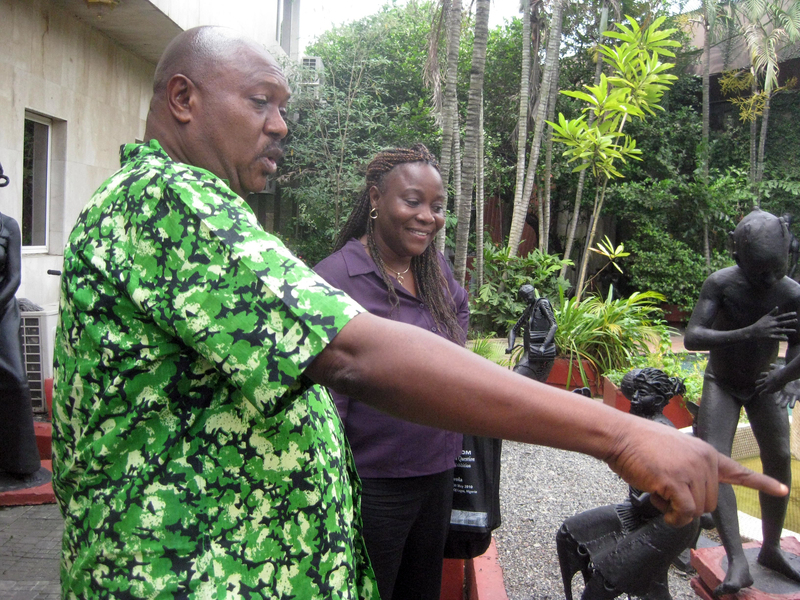 Shyllon started collecting art when he was a student at the University of Ibadan in the 1970’s studying engineering. He said he had to store his pieces in his friends dorm rooms as they kept piling up. He went on to become a very successful engineer in Nigeria and never lost his passion for collecting. He custom built the home he lives in now to hold all of his art, which today totals over 6,000 individual pieces. Shyllon has hundreds of these life-size sculptures. Some are made from bronze, fiberglass or metal. The tour started in the kitchen where a vase filled with real peacock feathers from the peacocks in the front yard sits on the counter top. For security reasons Shyllon would not let me take pictures inside the house so I will do my best to do describe the overwhelming amount of art that fills every single room of the house. Male peacocks mingle with the art works in Shyllon's garden. His art is literally so plentiful that every single bathroom in the house has at least four paintings on the wall and some even a large sculpture in the corner. His three kids, of which one lives at home, have no choice but to have paintings from prominent Nigerian artists adorn their walls. The Afrolisa hangs prominently in his daughter’s room. 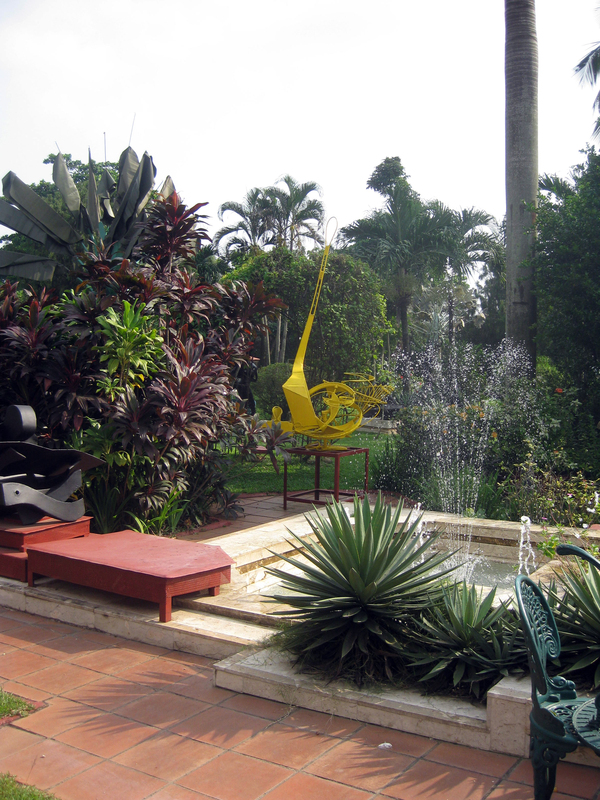 Shyllon collects mainly modern contemporary African art from Nigeria. 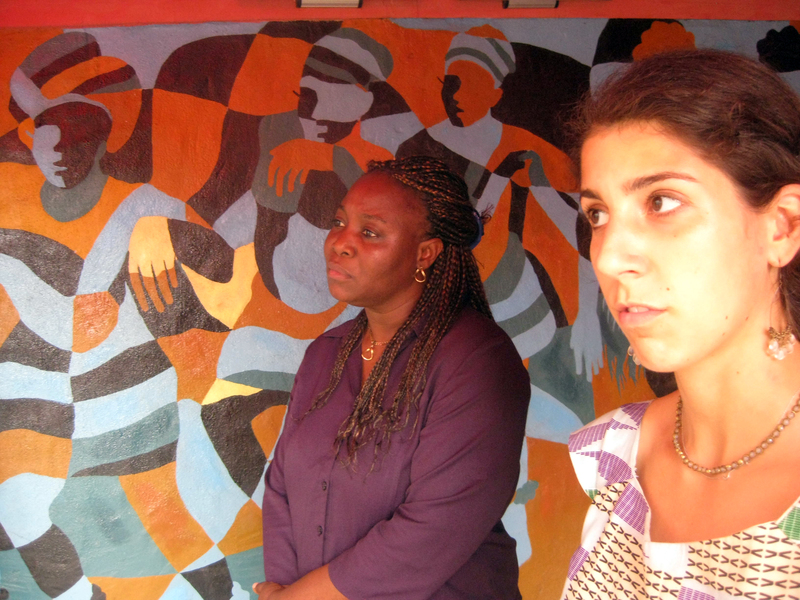 My host mom, Peju Layiwola and I listening to Shyllon explaining the painting we are standing behind. He reserves the wall space on the main staircase for foreign pieces, so you can find his small Dali painting there. He has pieces from every well-known Nigerian artist, including a piece of my mom’s in his collection. He does not discriminate between authentic Nigerian art–almost none of which is left in the country–and contemporary Nigerian art. He buys them all, but his first love is sculpture over paintings. He led us from the kitchen into the dining room from which we had a full view of the first living room. A massive crystal chandelier imported from Dubai cast a yellowy light on the unimaginable amount of wood, bronze, metal statues arranged on the floor. The newest addition to Shyllon's collection. 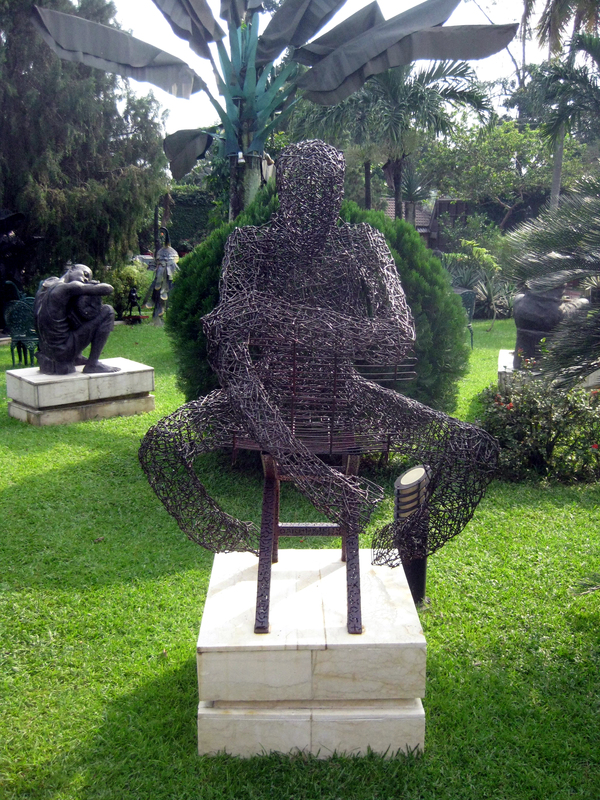 A sculpture of a person sitting in a chair made with nails. A 12-foot carving from Lamidi Fakeye with the most intricate depiction of Yoruba orishas stood in the middle, surrounded by tens of tall, short, wide, long wood carvings of orishas from Yoruba traditional religion. Water trickled from the wall in a marble fountain to make the room sound like a rainy season storm. “Do you spend a lot of time in this room,” I asked Shyllon. “Let’s see the rest of the house and then you can decide,” he replied. Up a few steps we passed into the Chinese parlor. Paintings made with tiny beads by artist David H. Dale spanned the walls and complemented the stunning white marble floor, walls and ceiling. This room led to a smaller room paneled in rich wood planks with more wood statues lining the walls. Another view of his impeccably landscaped garden. A flat screen TV on the wall felt completely out of place. Shyllon made a point to show us the bathrooms where equally impressive paintings and sculptures hung next to the toilet and the sink. 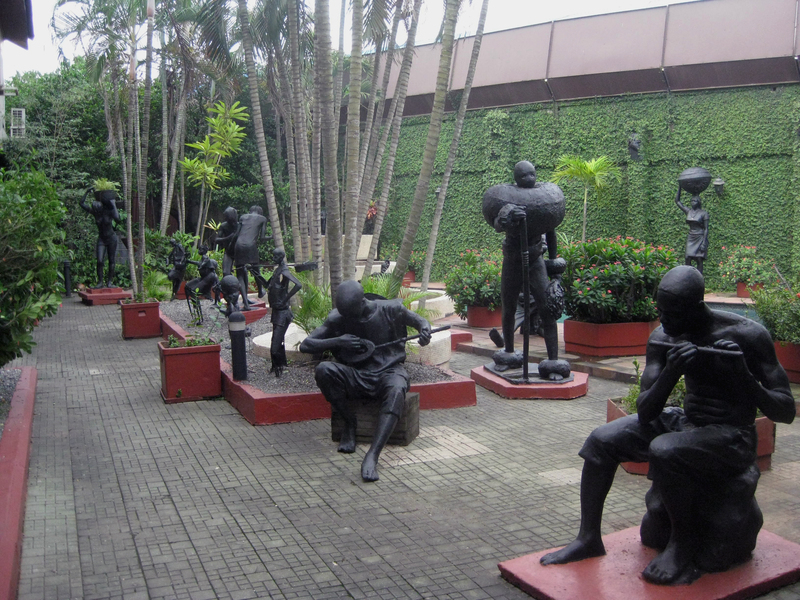 Rooms upon rooms filled with layers of figurine sculptures of Nigerian market women carrying their babies, bronze heads of prominent people in Nigerian society, wood heads of traditional Yoruba gods, paintings of all scenes and sizes followed. 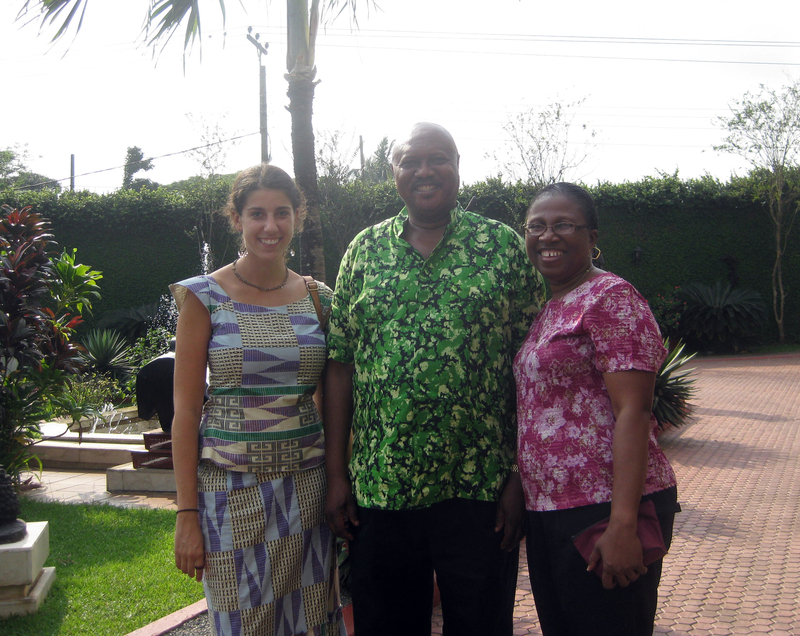 Shyllon and his wife posing with me in the garden. A narrow path for walking snakes around the sculptures in most of the rooms. All of it is neatly arranged, consciously placed. Shyllons says his most exciting moments are deciding how to fit in a new work, what to take out and what to rearrange. He has 300 pieces in his bedroom alone. The amount of art Shyllon has in his home is unfathomable; it is shocking and absolutely incredible. He has a personal friendship with all of the living artists displayed in his home. Suzanne Wenger’s handprint hangs framed on the wall. After the tour we ate pepper soup his wife had prepared for us with a catfish from his own catfish pond. He personally took us around the compound, pointing out interesting facts about certain works. We saw his snail pen (Nigerians consider snails a delicacy. ), his Chinese style temple where he attends to guests he does not want to welcome into his house and the playground for younger guests. The garden that faces Shyllon's house made almost entirely out of marble. My mom and I left Shyllon’s home elated. She had a very successful meeting and I had an unforgettable, once in a lifetime experience at maybe the most prominent African art collectors’ home. I spoke Yoruba with him of course and signed his guestbook in Yoruba. So with images of art for days in our eyes we once again ventured down the Lagos-Ibadan Expressway back to Ibadan. What a trip. 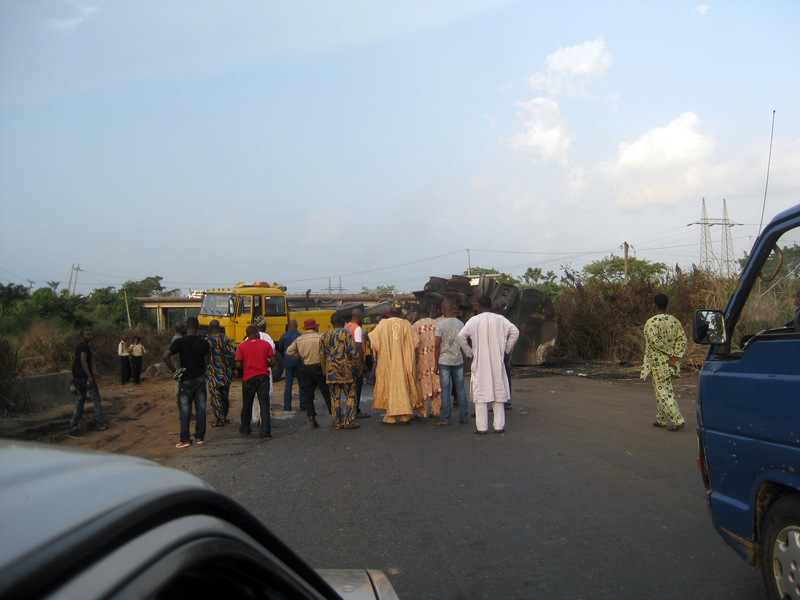 We were making record time on the Lagos-Ibadan Expressway and then we encountered this tipped oil truck holding up traffic in Ibadan. The trip went downhill from there.